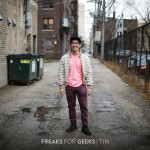 Freaks for Geeks, Chicago’s musical amphisbaena, draw from rock and hip-hop influences to create a bipolar hybrid of sludge jams and jaunty indie pop. Bucket Full of Nails is proud to premiere the video for “What Might Get Out” which you can stream below. Pre-order TIN via Bandcamp.